We provide certificate of translation free of charge. 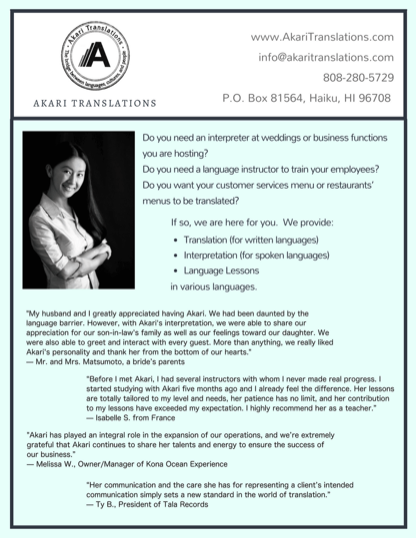 Receive a free quote (please email your document to info@akaritranslations.com). We negotiate on the price quote and terms. You pay a 50% non-refundable deposit. An editor will proofread the translated document. You will receive the translation and pay the remainder of the fee within 7 days of the delivery of service. Why are the rates different? With a Japanese text, besides the particles, it is impossible to tell without reading the text where one "word" begins and another ends. Therefore, computers cannot count the number of words. The standard formula for estimating how many English words will come out of a given Japanese source text is to divide the total number of Japanese characters by 2. Expedited fee for 24-hour turnaround may apply. Click the image below to see a PDF flyer for hotels.